The largest structures in the Universe are superclusters: not just clusters of galaxies, but clusters of clusters. They can stretch for millions of light years and be composed of thousands of galaxies. Yeah, like I said, it’s a mess. First off, this picture is a combination of observations from Hubble (in visible light, colored blue, green, and red), the Very Large Telescope (also blue, green, and red), and the Chandra X-Ray Observatory (X-rays, colored pinkish). In visible light you can see literally hundreds of galaxies, probably more, dotting the supercluster. The pink glow is from very hot gas between galaxies; it started its life as gas inside of galaxies that got stripped off and heated to millions of degrees as the galaxies plow through the space around them (I like to think of it as opening a car window to let a noxious smell out — the wind from the car’s motion pushes the air inside the car out the windows). The blue glow is perhaps the most interesting bit here: it’s a map of the location of dark matter. This type of exotic matter neither emits nor reflects light — hence the name — but it has mass, and that means it has gravity. As I described when this method was used to trace dark matter in the Bullet Cluster, gravity bends space, and light follows that curve. Galaxies farther away get their light distorted by the gravity from dark matter, and that distortion can be measured and used to trace the location of dark matter. The blue glow in the image above maps that. The thing about dark matter is that it doesn’t interact with normal matter (electron, protons, you, me, lip balm, oranges, whatever). But all that gas between galaxies shown in pink is normal matter, so when one galaxy cluster slams into another at a few thousand kilometers per second that gas gets compressed, mixed-up, and heated. But dark matter just blows right on through. So by comparing the location of the galaxies, the dark matter, and the hot gas, a lot of the cluster’s history can be unraveled. For example, one of the four clusters, located on the far right in the image, has very little hot gas associated with it. Apparently, it rammed through one of the clusters near the top of this image and had all its gas stripped away. 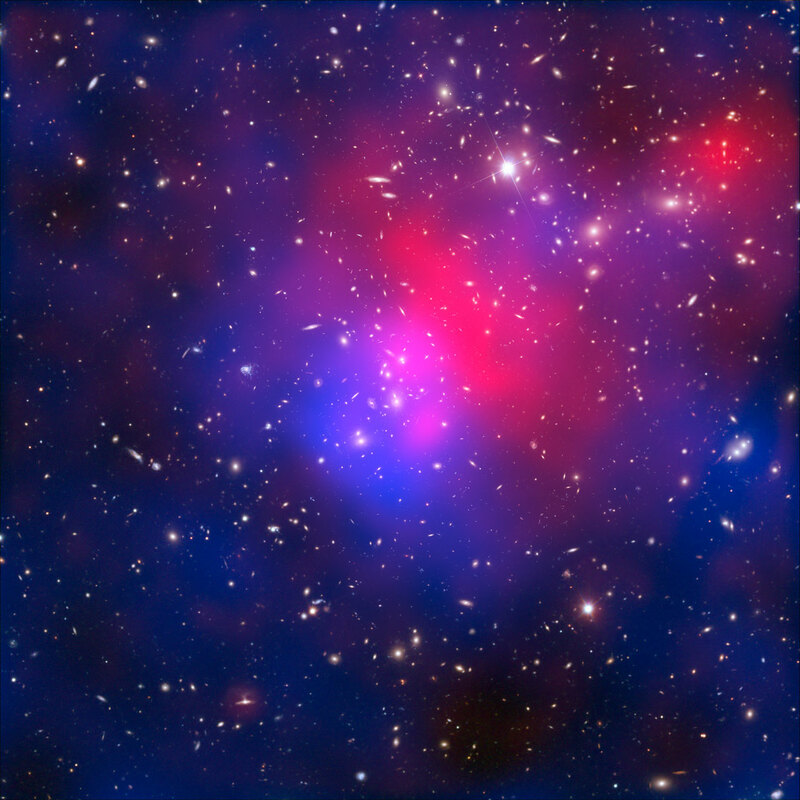 For another, there’s a slight offset of the dark matter and hot gas distribution, indicating lots of secondary mergers that messed things up. Bizarrely, they found that some of the hot gas had moved ahead of the dark matter. That’s really weird, since the hot gas should’ve slowed down in the collision. It would be like seeing the tortoise way ahead of the hare in a footrace. What the astronomers involved with this study think happened is this: about 150 million years ago, several clusters were headed for each other and began to merge, as shown in the diagram here. Most likely, there was one big one and several smaller ones. The smaller ones merged with the bigger one at pretty much the same time. This scenario apparently explains the structure seen, including that weird hot matter/dark matter swap: the gas underwent a gravitational slingshot, whipping around a local clump which flung it into a relatively empty region of space. This is all very complicated, obviously. The scenario spun by the astronomers depends on a lot of complex and advanced physics and math, and painstaking analysis of a lot of data. But if the details get difficult to understand, then let me at least leave you with this thought instead, something you can mull over and wonder about: by taking the data from a fleet of telescopes on and above the Earth, telescopes that see across the electromagnetic spectrum well beyond what the eye can perceive, we can piece together a history of an object with hundreds of trillions of stars spanning quintillions of kilometers of space and hundreds of millions of years in time. And that, my friends, is what scientists do. And that’s pretty cool.